Traditionally, computer scientists define an algorithm as a list of instructions for accomplishing a single goal. This definition treats an algorithm as (1) a coherent, usually textual, single object that (2) can be separated from its technological execution. Instead, we argue for the usefulness of studying algorithms in and as action. Algorithms-in-action, particularly computational algorithms, depend on actors outside them: the sources of the data they require as inputs, the machines that execute them, the storehouses that maintain their results and make them available for other processes, and so on. Algorithms are not stable texts but rather more-or-less stable agglomerations of people, machines, policies, data, and so on whose dimensions and components change over time. 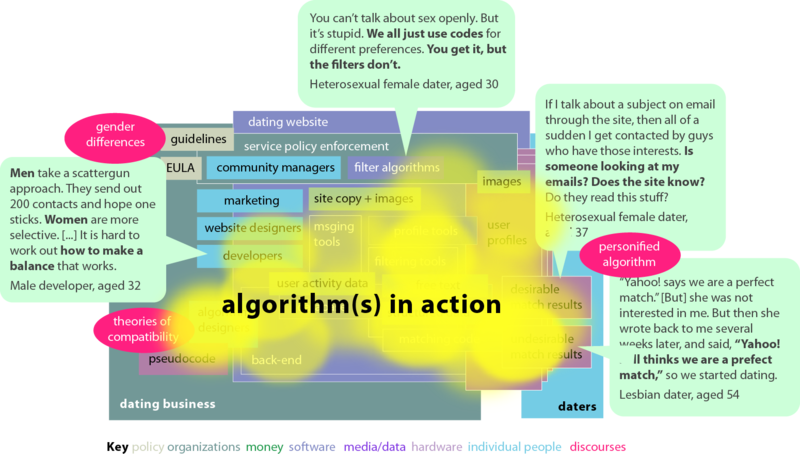 Our talk will examine the multiplicity and contingency of algorithms through two case studies from very different algorithmic sites — architectural software, and online dating services. Using those sites as springboards, it will argue that taking algorithms as multiple rather than singular and as material agglomerations rather than discursive texts opens up new entry points for creative and critical practice in design, the arts, and engineering.